Shanghai, Or Shanghae ("approaching the sea "), a city and seaport of China, in the province of Kiangsu, on the left bank of the "Wu-sung river, about 12 m. above its junction with the Yangtse-kiang, in lat. 31° 10' N., Ion. 121° 30' E.; pop. variously estimated from 250,000 to 320,000. It stands in a fertile plain intersected by numerous streamlets, and consists of old Shanghai, which is enclosed by a wall and moat about 3 m. in circumference, and several suburbs. The walled town, which is entered by six gates, has narrow, filthy streets, and most of the buildings are small and mean; but some of the guild halls and tea shops are fine specimens of Chinese architecture. Of its many temples, the largest is the Ching-hwang-mian (city and moat temple), on a rocky island in a serpentine sheet of water. The Roman Catholics have a large cathedral and the Baptists a church within the walls, and the American and London missionary societies have large schools. The foreign suburb, which is divided into three parts, the French, British, and American concessions, is laid out like a European city, with broad, paved, well lighted streets, and handsome houses and gardens. The Anglican church, club house, and masonic temple are among the principal buildings. Back of the quay, which has a bulwark of stone and stone jetties, stand the hongs of the foreign merchants. In the British concession is a race course, and lower down are ship yards, machine shops, and dry docks. Many square-rigged vessels lie at the foreign quays, and in front of the Chinese town the river is thronged with junks lashed close together. The population of the foreign suburbs in 1873 consisted of 62,844 resident Chinese, 5,566 Chinese employed in foreign hongs, 9,957 boat population and vagrants, and 2,000 foreigners; total, 80,367. The climate of Shanghai is subject to sudden changes in spring and autumn, and pulmonary and rheumatic complaints are common. The day temperature in summer is from 80° to 93°, and in winter from 45° to 60°. From June to October heavy rains fall. Shanghai has a mint, and manufactures of silk, cotton, vegetable oils and oil cake, iron ware, glass, paper, and ivory goods. It is connected by the grand canal and the Yangtse-kiang and other rivers with a large part of the empire, and is visited annually by 5,000 or 6,000 canal and river boats, and by 1,500 or 1,600 coasting junks. Its foreign trade is also very large. The number of entrances in the foreign trade in 1872 was 2,111, tonnage 1,165,-967; 940 vessels were British, 741 American, 135 Chinese, 127 German, and 47 French. The total value of foreign imports was $82,169,-694; of imports of native goods, $61,549,673. The value of the total exports of native produce was $45,504,851; of foreign products reexported, $50,880,627. The principal exports are tea, silk, cotton, straw braid and hats, mats, wool, skins, oil and oil cake, drugs, porcelain, and fans; imports, opium, treasure, grain, flour, manufactured goods, and coal. The value of the exports to the United States in 1874 was $15,868,556, of which $13,869,522 was in tea. 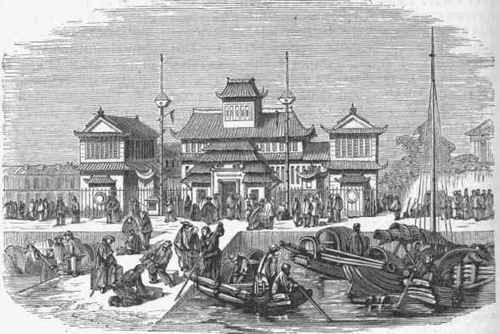 - Shanghai was taken by the British in June, 1842, but was given up in 1843, after the ratification of their treaty with the Chinese, when it became one of the five ports opened to foreign commerce. In September, 1853, it was captured by the Taiping rebels, who soon evacuated it. In 1860-'62 it was again threatened by them, but was protected by the British and French. Its commerce declined in 1865-'6, but it is again increasing. It is now one of the 14 Chinese treaty ports.